Clinique Happy In Bloom 2013 is a fresh floral smell, like a cool spring morning. 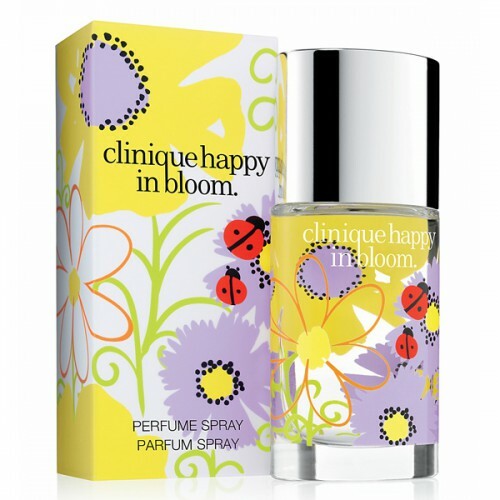 Clinique Happy In Bloom 2013 50ml. Eau De Toilette is a limited version of the popular summer fragrance Clinique Happy - Clinique Happy in Bloom. Fresh floral smell, like a cool spring morning with a delicate aroma of flowers covered with dew. Fans flavor, without a doubt, love Clinique Happy in Bloom, which flower heart blends unique Happy new frosty wet notes. It opens with notes of yellow plum, a cocktail of frozen fruit and notes of wet fresh green leaves and grass. Lily, white freesia and a mimosa is already known to us Happy give almost tactile sensation of flower petals. Transparent amber and white wood add depth of flavor and natural femininity. Women's Fragrances Clinique able to fill the heart feelings of joy and happiness. Soft floral aromas with hints of fresh herbs will help to refresh the senses and make the heart beat faster. These fresh and warm fragrances perfect light, optimistic and light-hearted nature. Intense floral aromas talk about happy love and youthful soul. They are perfect for women who know exactly who and what makes them happy - these women are confident, young and happy. Women's Fragrances Clinique contain notes of musk, sandalwood, mandarin, primrose, hyacinth and cucumber. Perfume Clinics will be a wonderful gift for the woman he loves! The success of the brilliant perfume Clinique Happy inspired the creators of the new prime minister - Clinique Happy in Bloom. Sparkling, cheerful - this fragrance is a fresh spring bouquet, exuding happiness. Sparkling, bright, fruity top notes of feminine poetic frame of white freesia, mimosa tenderness and carelessness lily of the valley. A mysterious sensuality of musk and amber wood tempt delightful breeze - do not fall in love is impossible!